Pistachios enhance many dishes other than desserts, including seafood, poultry, and salads. They add a rich flavor, buttery texture, and perhaps an unexpected but attractive green hue to the plate. But there can be some confusion if the recipe calls for shelled pistachios by weight or in cups and you only have the nuts in their shells—what is the equivalent? Luckily, there are some simple conversions you can employ to make any recipe with pistachios without a hitch. Although more expensive, it is often appealing to buy pistachios out of their shell, where they're called "nutmeats" or "kernels." Having to pry open each shell is time consuming, monotonous, and can definitely ruin a manicure. If your recipe calls for measurements of pistachios in their shells and you have a bag of nutmeats, there are some basic swaps you can make. If your recipe calls for shelled pistachios by weight and you are either removing the kernels from the shells yourself or you purchased nutmeats, you will need to convert the measurement if you don't have a food scale. If you decided to make the recipe last minute and don't have any pistachios on hand, or if you'd rather not shell the nuts and don't want to pay the high price for pistachio kernels, you can make a few substitutions for the green-skinned nut. If only the flavor of pistachios is necessary, and not the firm texture, you may substitute pistachio oil—2 to 4 tablespoons should do the trick. Make sure to reduce the amount of any other oil used in the recipe by the same amount. If the pistachio is not only adding flavor but also a crunchy texture, other nuts may be substituted in most recipes. Your best bets are pine nuts, almonds, hazelnuts, and cashews. Now that you know how to easily measure your pistachio nuts, you are ready to incorporate them into a variety of delicious recipes. Take a common fish dish to a whole new level with a roasted pistachio-crusted salmon, where Dijon mustard and lemon juice help the crushed pistachio pieces adhere to the fillets. For something really different, try pork, apricot and pistachio dressing, a sort of sausage "pate" that is cooked as a log and then sliced. If you think of dessert when you think of pistachios, there are plenty of recipes to choose from. For a confection calling for marzipan, make one with pistachio nuts for a bright green touch. And a homemade Turkish pistachio baklava is a nice change from the traditional version made with walnuts. 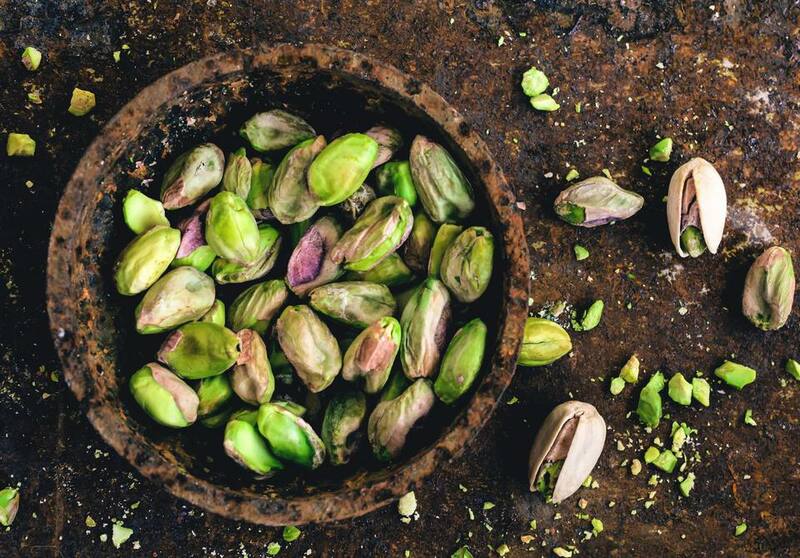 Whether you eat these colorful nuts out of hand or incorporate them into your favorite dishes, pistachios are one of the healthiest nuts out there. They are high in protein, full of healthy fats, contain beneficial antioxidants, and are a good source of Vitamin B6 and phosphorous.